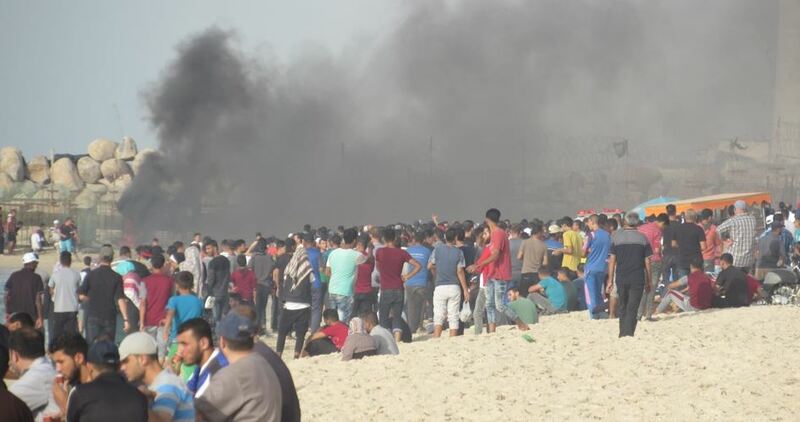 At least 25 Palestinians were injured on Monday when the Israeli occupation forces (IOF) opened fire at peaceful protesters on norther Gaza coast. Meanwhile, a 13-year-old boy was shot by the IOF soldiers east of al-Bureij refugee camp in the middle area of the Gaza Strip. The PIC reporter said that the IOF heavily fired live ammunition and teargas canisters at the Palestinians protesting on northern Gaza coast for the 16th week in a row. The committee praised the efforts made by Egypt, Qatar and the United Nations to alleviate the suffering of the Palestinian people living in the besieged Gaza Strip. It also called on human rights organizations to work toward holding Israel accountable at international courts for its crimes against Palestinian civilians. Gaza border protests, also known as the Great March of Return, started on 30 March with the aim of shedding light on the Palestinian refugees' right of return and pressuring Israel to lift the 13-year-long blockade on Gaza. About three months ago, the Gazans decided to expand the marches and started to demonstrate on a weekly basis near the sea border. The Israeli occupation forces (IOF) on Saturday afternoon violently quelled a peaceful demonstration staged by Palestinian and international journalists at Qalandia checkpoint, north of Occupied Jerusalem. Palestinian media sources reported that dozens of journalists took part in the demonstration near Qalandia refugee camp as part of Journalists Under Fire conference. A number of journalists suffered breathing difficulties when the IOF soldiers heavily fired stun grenades and teargas canisters. 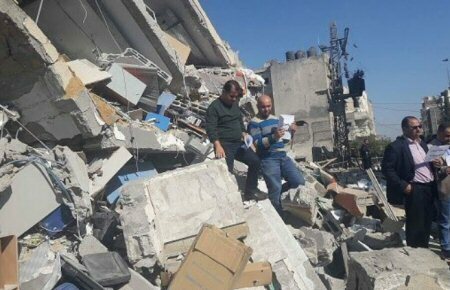 The Palestinian Center for Development & Media Freedoms (MADA) has condemned the destruction of Al-Aqsa TV Headquarters on Monday evening, 12 November, 2018, by the Israeli army, in implementation of the resolution taken by the senior officials and politicians at the Israeli government, as various data indicates. Al-Aqsa TV Headquarters was destroyed in Gaza, by Israeli warplanes, about a half an hour following the end of a security meeting held by the Israeli leadership with the participation of Israeli Prime Minister, Benjamin Netanyahu, at “Kiryah” Military Base, near Tel Aviv. This was followed by announcements reported, by Israeli media, that “the go-ahead was given to the Israeli army to carry out more severe attacks” on Gaza. Al-Aqsa TV Director, Mr. Ibrahim Thaher, stated to MADA that the TV office had received a phone call from Israeli Intelligence in which it was informed that the headquarters would be destroyed. Accordingly, the headquarters were evacuated of its staff immediately. Ten minutes later, drones began bombarding the headquarters with “warning” missiles, which was followed by a missile fired by F16 warplane, leading to the destruction of the headquarters and the interruption of transmission. According to explorations of MADA field research, at approximately 8:30 PM, on Monday, Al-Aqsa TV received an Israeli threat to bomb it. The TV staff quickly evacuated the headquarters and left. About half an hour later, at 9:00 PM, unmanned aerial vehicles (drones) began bombing the headquarters, where they fired five “warning” missiles intermittently. At approximately 09:15, a missile fired by an F-16 warplane destroyed the headquarters, which led to its destruction and transmission interruption. However, the Israeli warplane returned and bombed the headquarters with another missile, several minutes later, causing extensive destruction. Many houses and buildings, adjacent to the headquarters, were severely damaged. PNN further reports that this is the third time the headquarters of Al-Aqsa TV have been destroyed by the Israeli occupation army. The measure is part of a large-scale Israeli systematic targeting aimed at silencing the media and journalists, and blurring the practices and attacks of the occupation in Palestine. The Israeli army has destroyed in three large-scale military attacks, which erupted in Gaza Strip in the years 2008, 2012 and 2014, totaling 61 headquarters of media agencies. In 2014, 17 journalists were killed, in the Gaza Strip. Taking into consideration the serious escalation of the Israeli occupation authorities and its army’s targeting journalists and media outlets in Palestine, MADA believes that the impunity of perpetrators of such crimes has encouraged the Israeli army to continue committing such acts in an official and blatant manner, as in the case of destroying the headquarters of Al-Aqsa TV. Therefore, MADA Center has called on the Special Rapporteur of the freedom of expression at the United Nations, as well as the international human rights organizations, to endeavor and investigate the crimes of the Israeli occupation against media freedoms in Palestine, and to bring the perpetrators, and all those involved, to justice. 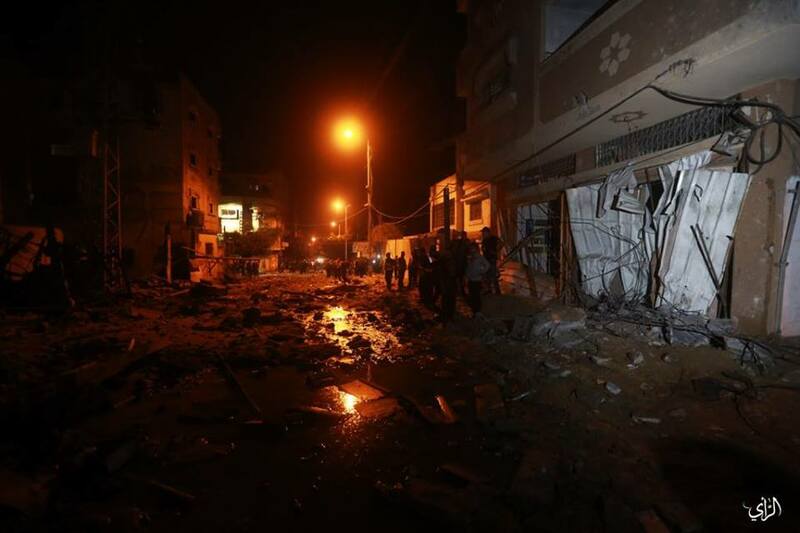 Israeli warplanes targeted on Monday evening al-Aqsa TV headquarters, west of the Gaza city, completely destroying it. Serious damages were caused to neighboring homes that were earlier evacuated. The Movement also called on international media institutions to condemn this serious aggression against press freedom. A Palestinian journalist was pronounced dead on Saturday afternoon, a couple of weeks after he had been injured with Israeli bullet fire. 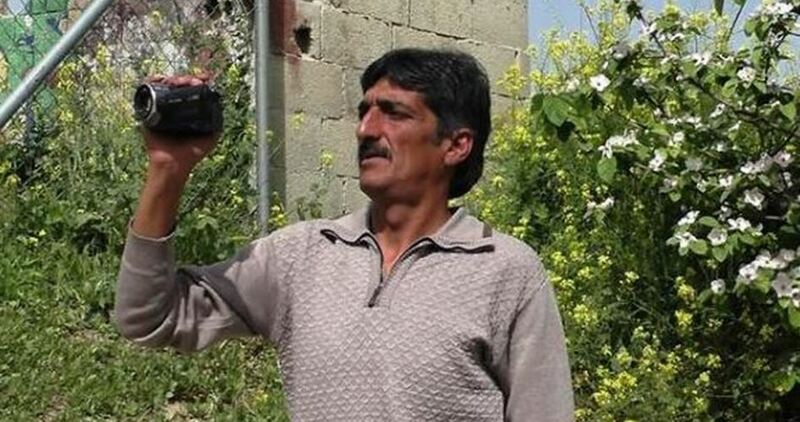 The Ramallah-based Palestinian Ministry of Health announced the death of Mohamed Ibrahim Shreitah, from al-Mazraa al-Gharbiya, in the central occupied West Bank. 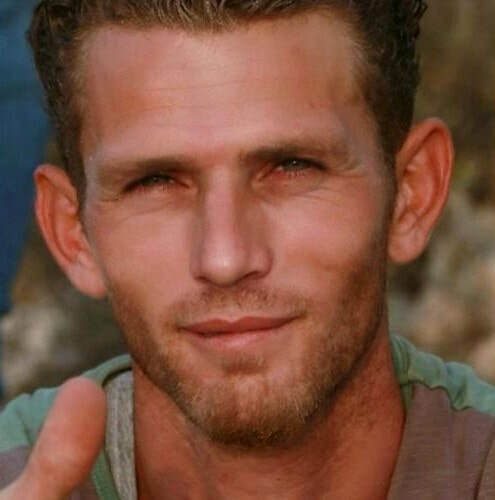 Shreitah breathed his last at the Istishari Arab Hospital in Ramallah. The casualty, along with eight other Palestinian young men, was shot by the Israeli occupation army on October 26 during clashes rocking Ramallah’s northwestern village of al-Mazraa al-Gharbiya. A number of Palestinian citizens were injured on Monday evening when the Israeli occupation forces (IO)F opened fire at the Palestinians taking part in the Great March of Return on Gaza coast. According to the Palestinian Red Crescent Society, 10 Palestinians, including a journalist, paramedic, and child, were injured by live ammunition, rubber-coated metal bullets, and teargas canisters. Spokesman for the National Committee to Break the Siege Adham Abu Salmiya on Sunday said that border protests will continue until the decade-long blockade imposed on the Gaza Strip is lifted. Abu Salmiya praised the role played by Egypt, Qatar and the United Nations to put an end to the suffering of the Palestinian people in Gaza. Gaza coast marches over the past few weeks have been a major part of the Great March of Return which is aimed at pressuring Israel to lift Gaza siege and shedding light on the Palestinian refugees' right to return. Since the start of Gaza border protests on 30 March, 230 Palestinians have been killed by the IOF, including 40 children and 6 disabled people, and over 23,000 injured. A horde of Jewish settlers on Saturday evening physically assaulted Palestinian human rights activist Imad Abu Shamsia and his son in Tel Rumeida neighborhood in al-Khalil city, south of the occupied West Bank. Abu Shamsia said that dozens of settlers attacked his house in Tel Rumeida neighborhood in the Old City of al-Khalil and violently assaulted him and his son, Salah, adding that he and his son suffered injuries during the attack. He also said that Israeli soldiers prevented him and his son from leaving their home or to go to hospital to receive medical assistance. 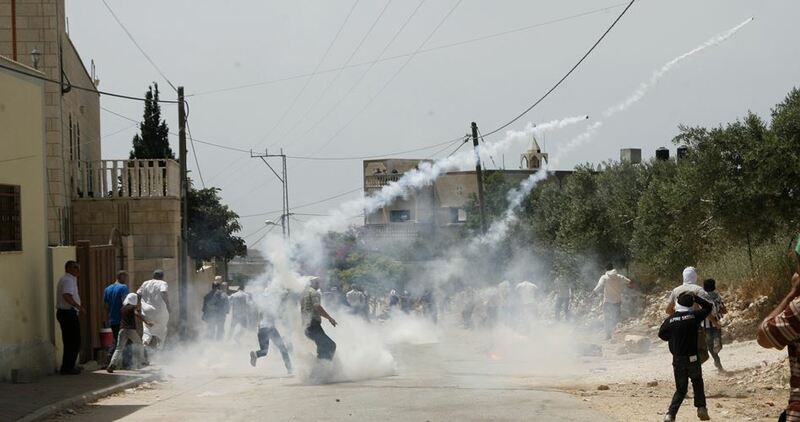 The attack was the third of its kind carried out by Jewish settlers in the past 24 hours in the Old City of al-Khalil. At least 10 Palestinians suffered injuries in similar assaults in the neighborhoods of Ghaith, as-Salayma, and Tel Rumeida and near the Ibrahimi Mosque. Among the abducted Palestinians is a father, and two of his sons, in addition to a journalist and his son. The soldiers rearrested a Palestinian detainee, identified as Yacoub Abu Assab, 46, from occupied Jerusalem, instantly after his release from the Negev Desert Detention Camp, after finishing a seven-year prison sentence. In Ramallah, in central West Bank, the soldiers abducted Mohammad Shreiteh, along with his sons Yasser and Tha’er, after breaking into their home and searching it, in the al-Mazra’a al-Gharbiyya town, northwest of the city. It is worth mentioning the Mohammad is the head of the Media Department at the Palestinian Detainees’ Committee, in Ramallah. The soldiers also abducted Shahed Ali Abu Laila and Adham Ibrahim Ladadweh, from al-Mazra’a al-Gharbiyya town, northwest of Ramallah, in addition to Yahia Bader Abu Alia from the al-Mughayyir town, northeast of Ramallah. Furthermore, the soldiers invaded many homes in Deheishe refugee camp, south of the city, and abducted a journalist and a former political prisoner, identified as Nidal Abu Aker, along with his son Mohammad. In Jenin, in northern West Bank, the soldiers searched many homes and abducted Mohammad Sa’id Zakarna and Majeed Mohammad Alawna. The soldiers also invaded Qabatia town, southwest of Jenin, searched the home of Jamal Hanaisha, and illegally confiscated 32.000 Shekels (approximately 8.630 Dollars) from the family. In addition, the soldiers searched homes in Tulkarem, in northern West Bank, and abducted Nasr Mohammad Na’alwa. 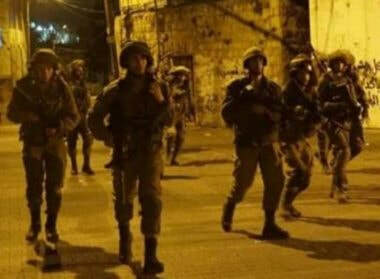 The soldiers also invaded Kafr Qalil village, south of the northern West Bank city of Nablus, searched many homes, and summoned for interrogation Waleed Saed Mansour, Qussai Yasser Amer, Arafat Afeef Amer and Mohammad Taher Amer. It is worth mentioning that the soldiers also invaded the home of Jamal Hanaisha, from Wad an-Naqqar area, in the northern West Bank city of Qalqilia, and violently searched it, before illegally confiscating 1.650 Shekels (approximately 445 Dollars).